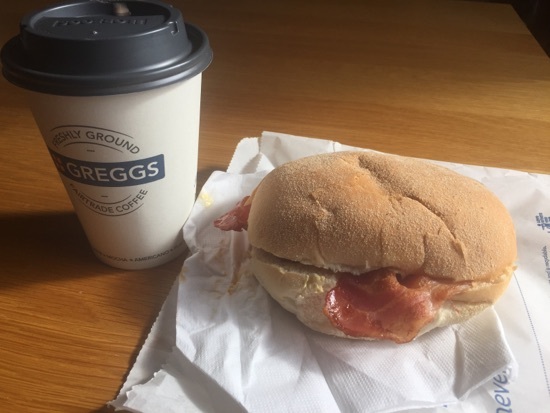 So this morning started off with a leisurely breakfast... bacon sandwich and a hot chocolate from greggs for £2. These were eaten and then I finished off the last minute packing. I skipped lunch and we waited for DH to get home from work so we could pack up the car and head off to the Travelodge at Glasgow airport. We set off about 4.30pm and as we were nearing Glasgow I ordered a dominoes to collect from their store in paisley. 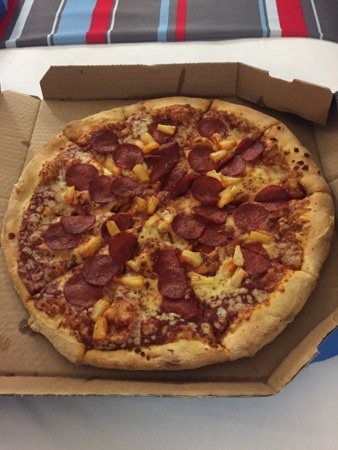 I had a large pepperoni and pineapple pizza. This was really good as usual. The large pizzas are £7.99 each. 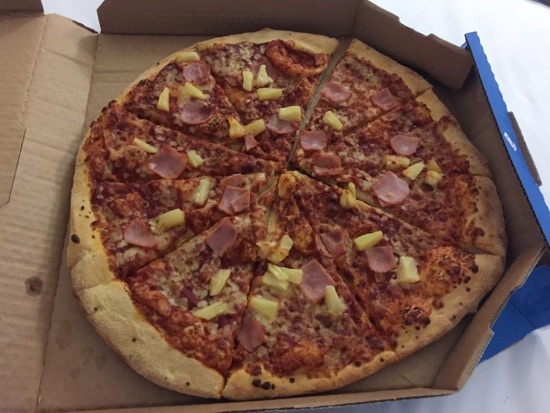 DH had a large ham and pineapple. This was also really good. We both shared with DD who had a few slices. 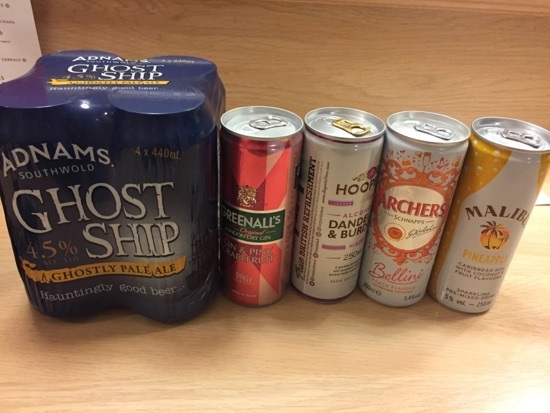 We brought a selection of drinks with us to enjoy while we chill in the room before having a reasonably early night. DD had a Coke from the vending machine in the hotel reception. Alarm was set for 6.40am but we were awake just before it, got ourselves sorted and drove to the offsite parking compound, the transfer was very quick and we were at the airport just after 8am. 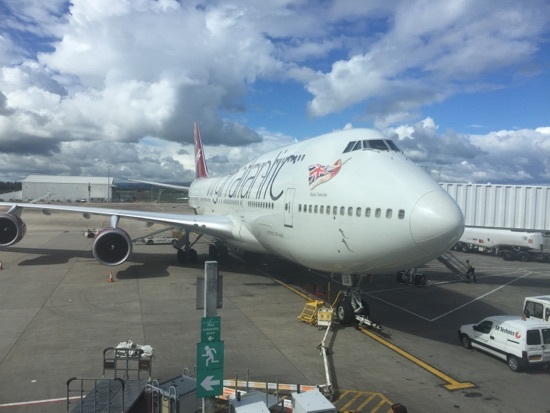 We were the 6th family checked in with virgin and through security and sat in frankie and bennies by quarter to 9. 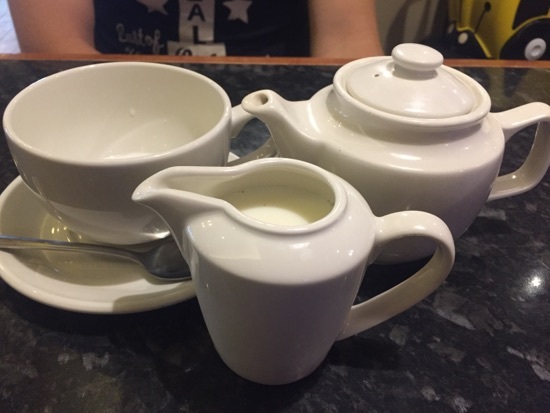 DH got a pot of tea, always comments this is his last proper cup of tea for 2 weeks. 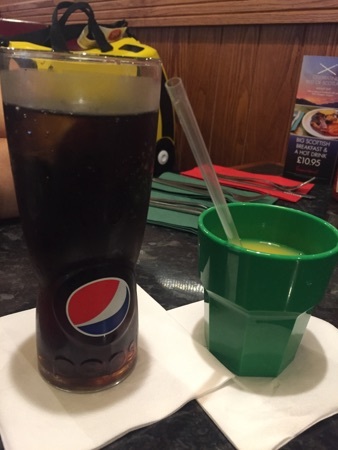 I had a Diet Pepsi and DD had an orange juice. 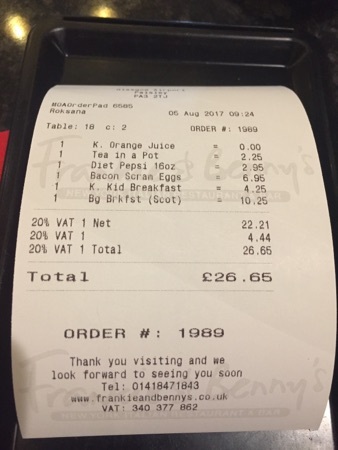 DD ate from the £4.25 kids menu. This was a choice of 4 items and the drink was included. 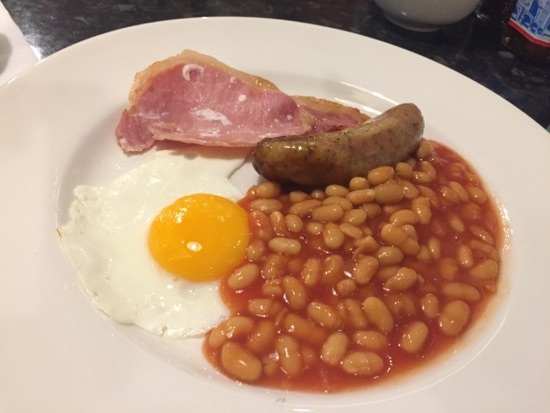 She had beans, egg, bacon and sausage. She enjoyed this, it was a decent sized portion for the price. 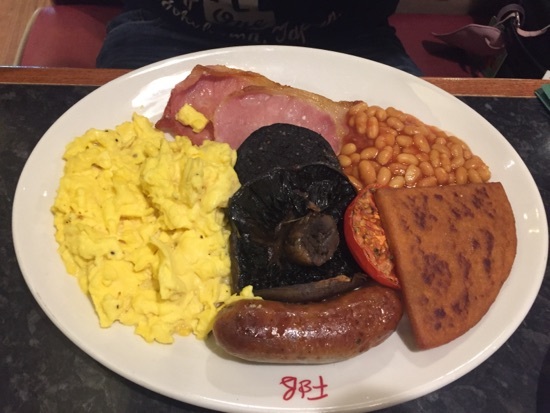 DH had the big breakfast, he enjoyed this. The service here was really quick, the food came out less than 10 minutes after ordering. 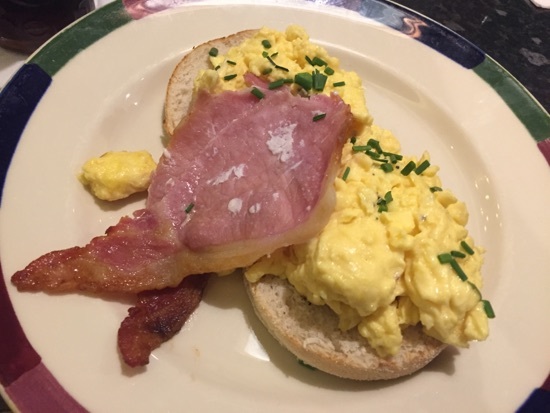 I had bacon and scrambled eggs on an English muffin. This was nice, there was loads of scrambled egg so didn't manage it all. This came to £26.65 in total. It took a while for us to get the bill, she kept looking over probably waiting for us to finish our drinks, in the end we just asked for it. We then had a look round a few shops and headed down to the gate to wait for our flight. Our plane was Ruby Tuesday. We boarded about 11.30am and were ready to push back by 11.45. We took off slightly earlier than our 12.05 scheduled time. 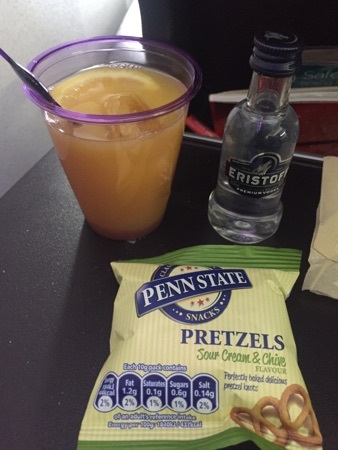 The crew came round with pretzels and drinks service about half an hour into the flight. I had a vodka and orange, the miniatures contain 50ml. 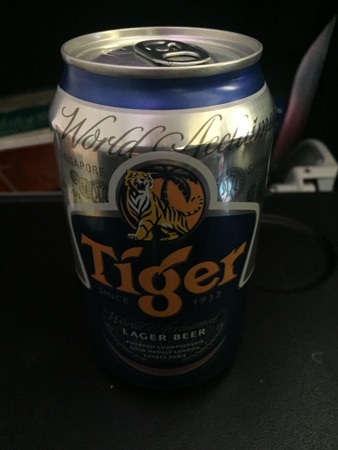 DD had a Coke and DH had a tiger beer. 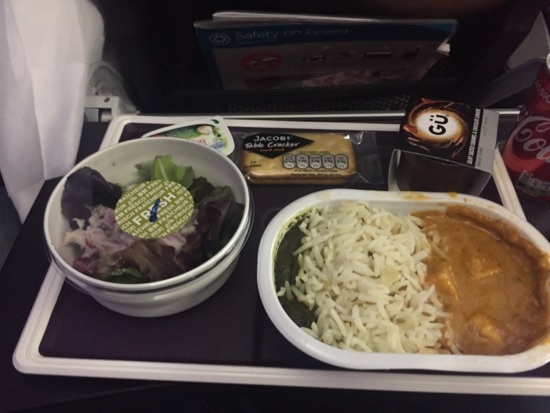 About an hour and a half into the flight we were served our meal. The choice was pulled pork, chicken, or curry. They had ran out of chicken by the time they got to us. I had the pulled pork, this was pretty good. 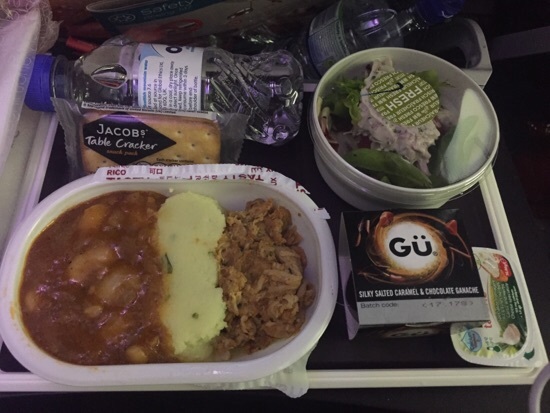 It was pulled pork, mashed potato and baked beans. It came with a salad, crackers with Boursin and a salted caramel and chocolate ganache hi pot. I really enjoyed all of this meal especially dessert. DH had the curry, this was nice enough, just the portion sizes are abit on the small side. We were going to get DD the chicken but they had just ran out when they got to us. The had a few extra children's meals and asked us if we would prefer one of them for her. DD had the kids cheese and tomato pasta. She ate about half of this. She also managed half of her gu pot, so I finished it off for her. About an hour and a half before we landed the crew brought round afternoon tea. 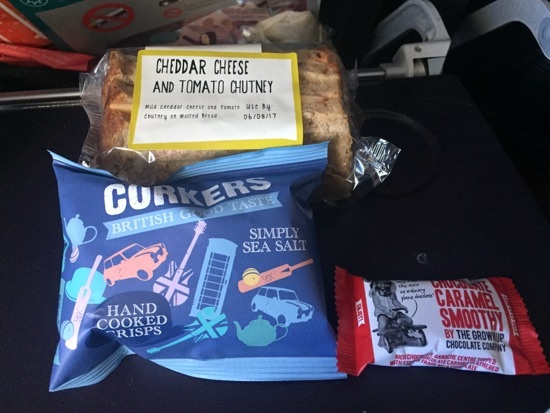 This was a cheese and tomato relish sandwich, a bag of sea salt crisps and a chocolate ganache and caramel chocolate bar. The chocolate bar and crisps were really good! The sandwich was alright but a little bit dry. We landed at 3.30pm. Unfortunately we were held up for a while whilst the ground staff found us a gate, the airport was exceptionally busy! It took about 30 minutes after landing to arrive at our gate. We were then held on the plan for a further 20 minutes as the immigration hall was very busy so they wouldn't allow us off the plane. 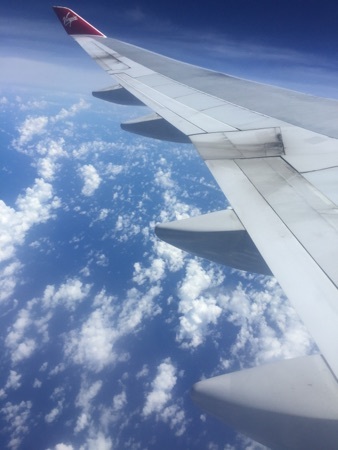 When we did get off we were directed to the self service machines and then through to see an immigration official, we were through immigration within about 15 minutes of leaving the plane which we were very pleased with. As we were waiting for our bags we got the dreaded news that they had closed the ramp due to a storm in the area and were predicting 30mins to and hour before it would be open again, so no bags would be delivered. We finally got our bags at 6.30pm, a full 3 hours after landing. After such a long wait we were desperate to just get to the hotel, DD managed really well with the long delay. We hauled our bags past 2nd bag drop and though to the terminal on the monorail and out to the hire cars. We drove away from the airport at 7pm. We checked in at the Radisson celebration and first impressions seem pretty good, we weren't expecting much for price and based on reviews but it's fine for what we'll use it for. After dumping our bags we headed out for something to eat. 5 guys is almost opposite our hotel on the 192 so we decided to eat here. I got a cheese burger with grilled onions, ketchup and mustard. This was so good! 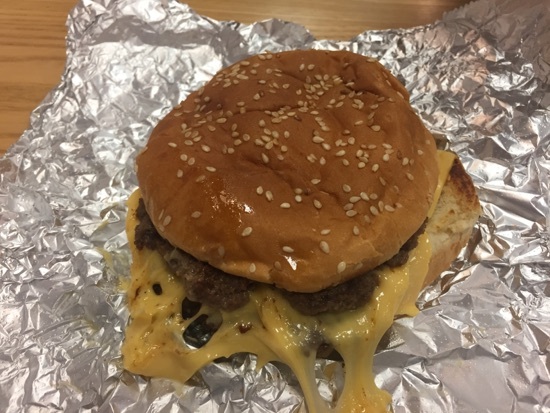 Really juicy and loads of cheese! Just right for something quick before falling into bed. 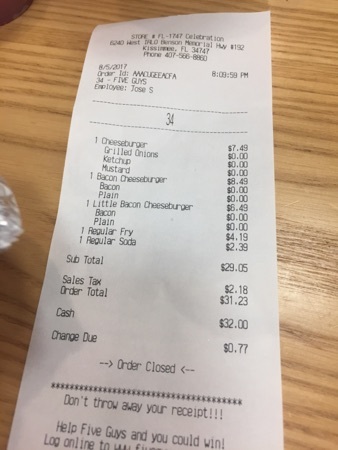 DH had a bacon cheeseburger with no extras. He really enjoyed this and was finished in no time. 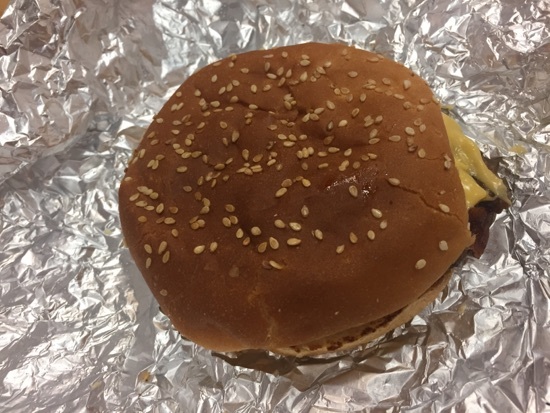 DD had a little bacon cheeseburger with no extras. 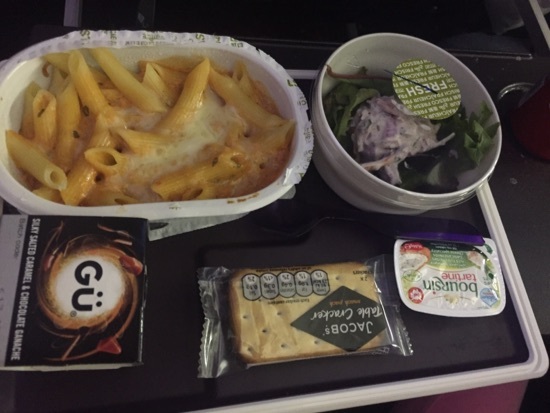 She ate about 3/4 of this and really enjoyed it, she said it was as good as McDonald's . We also got a regular fries to share between us and a regular soft drink. 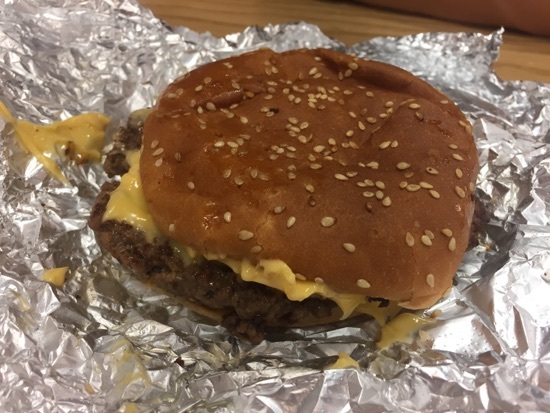 This is our first trip to 5 guys in Florida (I've been to one in Newcastle) and it was great! It's somewhere we will definitely return to in the future. Service was really quick too! The total came to $31.23 which is abit on the pricy side for fast food but the quality was fantastic. We headed back to our hotel after picking up some drinks in Walgreens, 2 bottles of Gatorade for $5 for the room and 24 bottles of water for $3.49 for to take to the parks.